Pumpkins, carrots, onions–this is as close as you’ll get to serving fall in a bowl. Roasting the pumpkin gives it a deep caramelized flavor that’s delicious. 1. Preheat oven to 425°F. Cut pumpkin into quarters; discard seeds. Place on a baking sheet, and drizzle with 2 tablespoons of the olive oil. Bake in preheated oven until tender, 45 minutes to 1 hour. Cool until easy to handle. Remove skin, and discard. Set aside 1 1/2 cups (about 15 ounces) cooked pumpkin; reserve remaining pumpkin for another use. 2. Heat remaining 2 tablespoons olive oil in a large saucepan over medium. Add onion, celery, carrots, garlic, thyme, sage, and oregano; cook, stirring occasionally, until vegetables are very tender, 8 to 10 minutes. (Do not brown.) Add salt and turmeric; cook, stirring often, 1 minute. Stir in chicken broth and 1 1/2 cups cooked pumpkin; bring to a simmer. Cover and simmer 15 minutes. Remove and discard herb sprigs. 3. Place half of pumpkin mixture in a blender. Remove center piece of blender lid (to allow steam to escape); secure lid on blender, and place a clean towel over opening in lid. Process until mixture is very smooth, 1 to 2 minutes. Transfer to a large bowl. Repeat procedure with remaining pumpkin mixture. Stir in the apple cider vinegar. 4. Whisk together sour cream and milk in a small bowl. 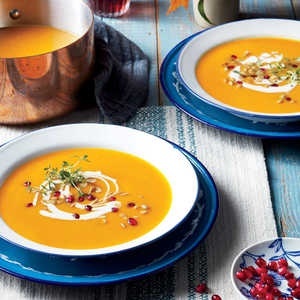 Divide soup evenly among 6 shallow bowls; drizzle with sour cream mixture, and sprinkle with pomegranate seeds and pumpkin seeds, if desired. 5 Minute Video: How Do You Say No to Something You Like? 5 Minute Video: New Year Resolutions–Do You Make Them? Flowers are such gifts of nature. Any time of year in California you can find something in bloom. 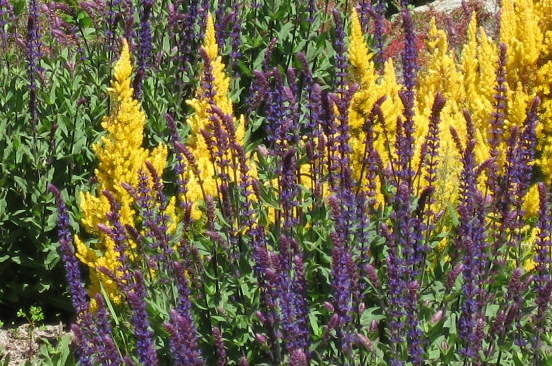 Even in our severe drought, nature finds a way of adding some beauty and color to the world. I love flowers in my yard, as well as cut flowers in my home. They brighten my mood and always seem to calm me and make me happy. What I’d never quite embraced was the idea of flowers in my food. A couple of days ago, I have a wonderful lunch at a friend’s home and she had made a salad with a variety of home grown flowers on top. She is an incredible gardener and beautiful cook, so I readily enjoyed both the beauty of the salad and flavors of these flowers. 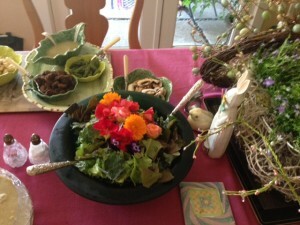 I did some reading about edible flowers and here are a few things I learned and suggestions. First, be very careful if you have asthma or other allergies. Also, proceed with caution with purchased flowers due to the use of pesticides and herbicides. And they should be used sparingly, too much of a pretty blossom can cause digestive problems. Here’s a few ideas to use the petals of the flowers in your meals. Do a little research, maybe starting at your local farmers market. I’m eager to learn more, so please feel free to share your comments about other uses of flowers in foods you’ve tried and enjoyed. Last week my dear longtime friend, Carol, invited me to join her to hike a nearby trail which is part of the Mid-Peninsula Regional Open Space. I’d grown up nearby and never even knew it existed. It was a spectacular winter day in California, the air was clear and fresh, and I was outdoors with a good friend. Doesn’t get much better! My senses felt so much keener. Without the continual sensory overload of urban living in Silicon Valley, I opened up fully to my surroundings. I felt the aliveness of the hillside around me and it energized me. The air was fresh and cool in my lungs, I heard the wind rustling in the trees above, and I saw several varieties of birds flying overhead. I noticed several early season wildflowers—bright purple blossoms and delicate yellow flowers were tucked in the greenery along side the path we walked. Plus, being able to spend several hours with a good friend during a time when our lives often are so full of the busy-ness–was a real gift. I was reminded of several important things that day I thought I’d pass along. ….There are treasures in our own backyards. Find them. ….Exploring new places will awaken your senses and your sense of being. …..Walking outdoors on a trail is a great, easy and fun way to get in exercise and fitness. …..Sharing experiences are what weave friendships together through the years. Also, an easy, non-rushed conversation over several hours makes me truly appreciate special those people in our lives. Drink chrysanthemum tea. Chinese Medical Practitioners say Chrysanthemum is a cooling herb which clears the head. It is commonly known as Ju Hua Cha and is consumed in mainland China as a refreshing and cooling beverage. You can buy dried Chrysanthemum flowers at Asian supermarkets. Add boiling water with a little honey and you have a drink that is not only cooling, it is soothing to the body. Chrysanthemum Tea is also good at the first sign of headache, fever or chills. You are currently browsing the archives for the Sensuality category.